Machines are all about making life simpler and easier. They help us do a lot things that we couldn’t otherwise accomplish, and there is no place that is more true than in the Service, the Production and the Manufacturing environments. 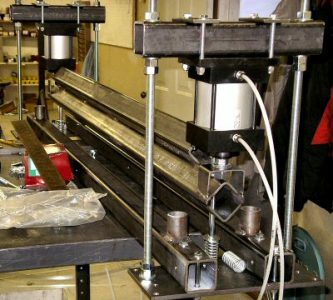 So many times a simple Machine, a Jig, or a Fixture has saved the day — or saved a bunch of time on a process! 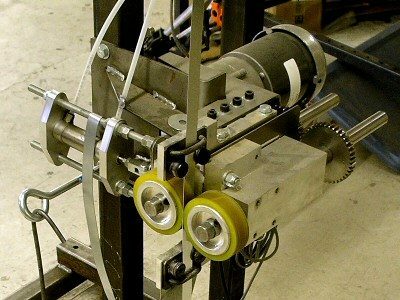 Jigs, Fixtures & Custom Machines are all about getting things done faster, easier, and more consistently. Designing and building custom machines is a main stay for Synthesis. It’s Product Development for a one-off specialty product. 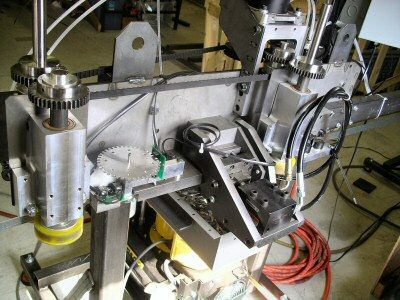 Whether it’s a simple hand operation machine or fixture or jig or tool, we do custom machines. We also do bigger stuff either as one-offs, or in small batches. 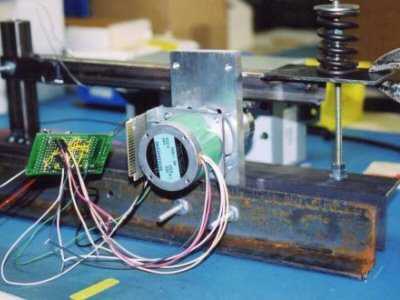 We design and build for the specific application – large or small, manual or automated. For some customers, we provide only the design, and they build it. 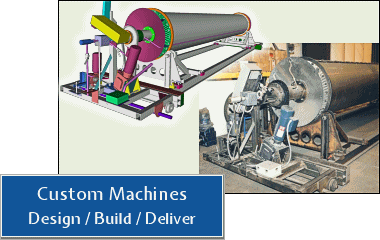 For other customers we design, build, and develop the machines, then deliver complete functioning unit(s). Some examples are explained in the paragraphs below, while images give some illustration. 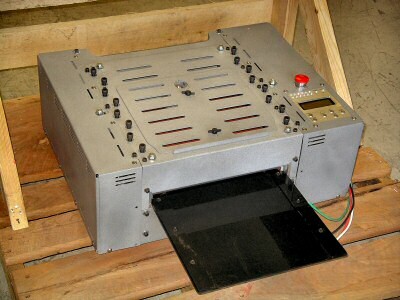 Additionally, there is slide show of project images at the bottom of this page which show many samples of custom machines. If you want more detail about how we can assist you, please let us know. Accumulation Conveyors are in material handling operations like Wal-Mart distribution centers as well as many other huge facilities around the world. They play a vital role in automating and distributing goods for stocking and loading. Since they are so important, the durability and dependability are critical. 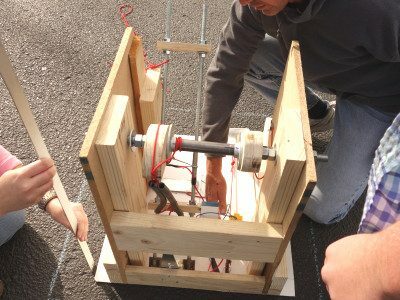 At Synthesis we designed and built first prototypes of a conveyor engagement machine, then tested them for over a million cycles just to prove the point. These small machines are now produced in large volumes to meet the extreme demands of their environments. 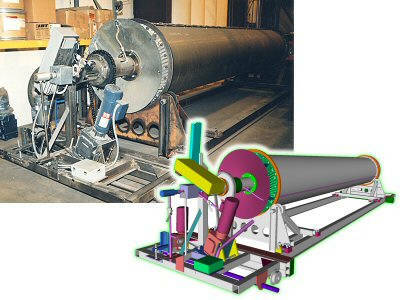 One customer contacted us about building specialty high volume durable lamination machines. They were burning out commercially available units at an alarming rate — interrupting production for repair. The losses in product, production time, and repair were staggering. 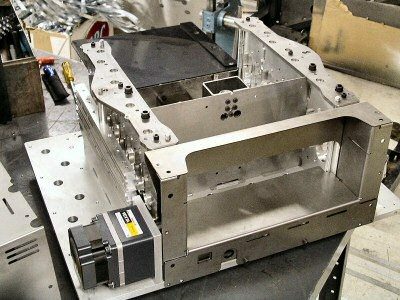 So, they hired Synthesis to design and build a better machine. A decision to make custom machines is not easy. Since the cost to design and build is high, it must pay for itself in labor, spare parts and production up-time. We took the job to design and build 3 custom machines — 2 production, and one spare. Once delivered, 2 went into production and, as expected, the throughput was higher than previous machines. More importantly, quality also improved because we evaluated the whole process in the design phase. One key adaptation: rollers and lights from HP laser printers for accurate control of heat and pressure. On the production floor, the new custom machines well out-lasted their predecessors. They were hoping for 5X longer, but we over-shot. Instead of replacing the old ones every few weeks, the new custom machines lasted years. The high cost of engineering, developing, and building new machines was pay back many times over — both in dollars and in the stresses of dealing with stopped production lines. The Custom Machine we call Rock ‘n Roll is one of our favorites. 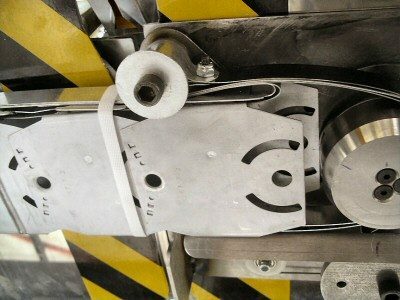 It gets its name from the action it takes as it rolls the mold as the whole machine rocks. This customer had a smaller version of the Rock ‘n Roll, but contracted Synthesis to design the bigger, better version. The design addresses several heating and cooling issues as well as stiffness and drive issues to function properly. Using skills from previous endeavors, the new machine was designed in ways that the customer could build. They built a couple of these custom machines, and after more than a decade, they are still in use. 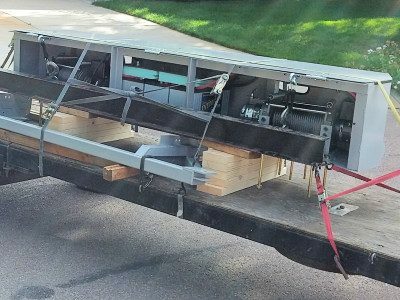 For the same customer, but in a much larger format, we designed a similar machine to lift a 10,000 pound mold, 12′ in diameter. The machine had to lift the mold, carry it around and orient it in every possible position. 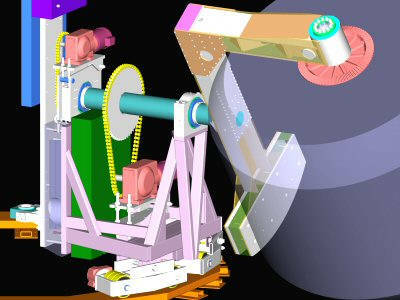 The kicker is a single arm support of the giant overhanging mass. 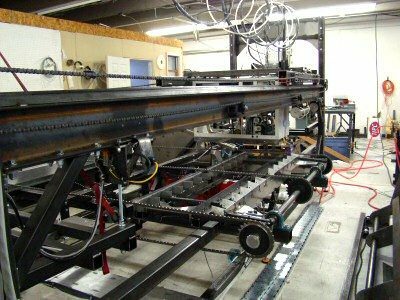 Needless to say, this custom machine project was one of both special design considerations as well as strength and materials — all of which we accomplished. With big motors to move it, and special tracks to guide it, the machine eventually rose to full function. It includes the bevel gears on the background on this web page — the big ring being 42″ diameter. Now to microscopic. 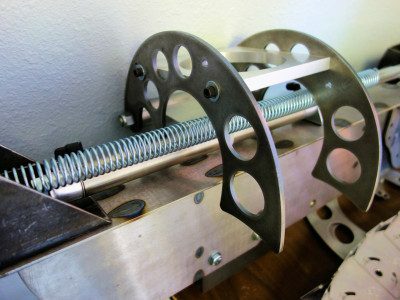 A custom machine — or really a manufacturing fixture to hold parts for production — was designed and first built at Synthesis. The fixture is unique because of the size. It will fit in your hand, then functions to bend tiny edges of thin metal parts. (Parts shown.) In the same fixture, we thread 0.003″ diameter wire between the small parts that look sort of like bones. We call it “Sewing the Bones” since it electrically connects these small parts by “Sewing”. It then holds everything while a press secures it under 3o tons of force. This custom machine fixture is a contrast. 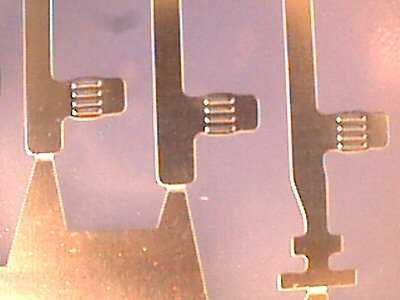 First tiny, delicate wires and small metal pieces, with huge press forces to complete the assembly. It has micrometer driven alignment for precision accuracy, and a 30 Ton press. It’s made super accurate for precision, yet built from Rc60 heat-treated tool steel to support press loads. Truly a contrast in engineering thoughts, yet the fixture was a success. Our last example is the biggest and most complex machine we’ve built. This was a project that started sort of small, then grew to automate more and more of the factory processes. Check out the video below to see the machine in action. There is just so much going on in this custom machine that it’s really more like several communicating custom machines all in one. What an amazing and all consuming project. Through the process of design and development there were many creative ideas to work out and plan. 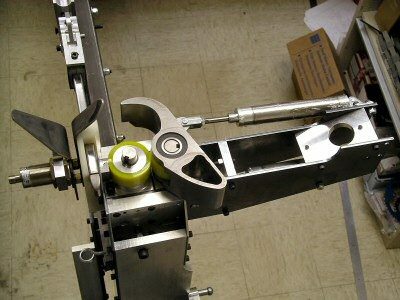 There are special jigs and fixtures inside the machine. There is timing and sequencing to an extreme, but the pinnacle is bringing it all together to work as one. Enjoy the video. Custom Factory Automation Machine Design and Build at Synthesis. Whether your need is something small and light, or something massive, we’re ready to help you design it. Then, if needed, we’ll build it and test it. 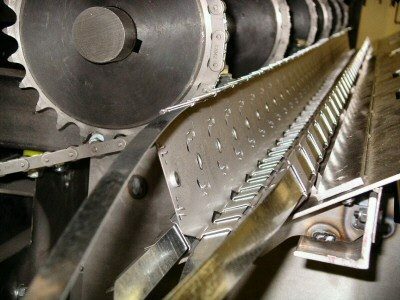 We do One-Off machines and fixtures and jigs to accomplish specific tasks, as well as small machines to produce in quantity. It’s worth the call. All of the above custom machines and fixtures are for specific customer requirements. Some perform factory automation functions, some are test stands, and some are simple manual fixtures. One is a contest winning catapult. All were designed at Synthesis, and most were also built here. Some of the componentry is off-the-shelf, some is new either by CNC or fabrication or other. 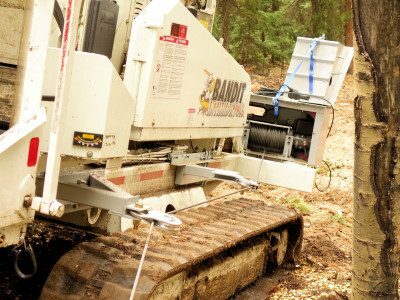 We understand the need for both cost efficiency and for durability and dependability in custom machines — But, Function Above All. Read more about Custom Equipment. 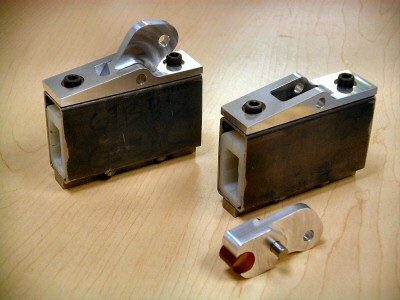 Please let us know if you have need for jigs, fixtures, or custom machines. We’re happy to discuss possibilities and ways we can help.